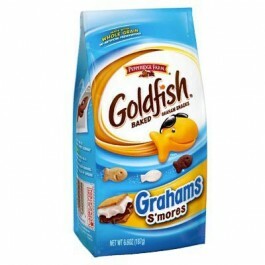 Goldfish Grahams en S'mores maken samen een heerlijke combinatie waar je niet vanaf kunt blijven. Geniet van de honing, marshmallow en chocolade smaak. Whole Wheat Flour, Unbleached Enriched Wheat Flour (Flour, Niacin, Reduced Iron, Thiamine Mononitrate [Vitamin B1], Riboflavin [Vitamin B2], Folic Acid), Sugar, Marshmallow (Corn Syrup, Sugar, Modified Cornstarch, Gelatin), Vegetable Oils (Canola, Palm Kernel, Palm), Cornstarch, Cocoa Processed With Alkali (Dutched), Honey, Contains 2 Percent Or Less of: Invert Syrup, Semi Sweet Chocolate (Sugar, Chocolate, Dextrose), Brown Sugar (Sugar, Invert Sugar, Molasses), Leavening (Baking Soda, Baking Powder [Sodium Acid Pyrophosphate, Baking Soda, Cornstarch, Monocalcium Phosphate]), Nonfat Milk (Adds A Trivial Amount of Cholesterol), Unsulphured Molasses, Salt, Corn Syrup Solids, Natural Flavors And Soy Lecithin.